Abruzzo and Molise are typically grouped together but in fact have very different histories, topographies and wines. Most consumers have little in-depth knowledge of the wines of these two regions, as not much has been written specifically about them; even experts tend to refer to these wines in generic terms. Unlike the Langhe or Chianti Classico, where basic differences between wines made in different communes have been investigated and described in great detail, there is scant information on how specific grape varieties, geology, exposures and other factors contribute to the character of the wines of Abruzzo and Molise. For the past fifteen years I have been interviewing local producers, viticulturalists and academics on the geological and viticultural aspects of Italy’s wine regions and the nuances of various wine production sub-areas of Abruzzo. Of course, in some instances such differences are blurred because estates own vineyards throughout the region and blend their grapes. Characterizing Molise’s wines in depth will require more time and legwork. Abruzzo is best known for three wines: Montepulciano d’Abruzzo, Cerasuolo d’Abruzzo and Trebbiano d’Abruzzo, which are also three region-wide wine denominations, a rarity in Italian wine circles. Two specific sub-areas have also been identified, Controguerra (established as a DOC in 1996) and the Colline Teramane (DOCG in 2003). One of Italy’s most beautiful regions, Abruzzo features what are arguably the most spectacular landscapes of central Italy outside of Tuscany. The region also offers sybarites a bounty of high-quality food products, including saffron (Italy’s finest), white truffles, porcini and vegetables, flavorful fish and crustaceans, unique pasta dishes, Italy’s best lamb, and local cheeses and salumi too numerous to count. The long coastline hugging the Adriatic sea and the mountainous interior also provide myriad of microclimates and terroirs. The climate is heavily influenced by the Apennine mountain range that runs north-south down Italy’s middle; Abruzzo’s Gran Sasso massif, at 2,914 meters (9,560 feet) above sea level, is the highest point in the range. It follows that the region’s interior has a continental climate, with frigid, snowy winters and cooler summers, while the coastline is characterized by a temperate Mediterranean climate. The geology is also highly varied, with marly-clay, sand-rich flysch and limestone soils. Gravels, and alluvial deposits dominate the coastline’s flatland viticultural areas. For all these reasons, Abruzzo’s wines should offer noteworthy differences even when they’re made from the same grape variety, although this isn’t always the case. The wine production areas within Abruzzo are Controguerra, Teramo (the Teramano), Chieti (the Chietino), Pescara (the Pescarese) and L’Aquila (L’Aquilano). In the northeast, just south of Abruzzo’s border with the Marche, Controguerra is characterized by generally low-lying hillsides that gently slope down from the interior of the province of Teramo toward the sea. The proximity of the sea results in generally warmer average daytime temperatures; a plethora of rivers and streams makes for numerous different microclimates, but Controguerra wines, for the most part, have yet to reflect such diversity. Wine towns in the area include Ancarano, Controguerra and Torano Nuovo; reference-point Abruzzo wine producers of the area are Camillo Montori and Illuminati, but there are other serious estates, including Barone Cornacchia and Monti. As the name implies, the Colline Teramane are located near Teramo. This is an extremely large viticultural area that may be further subdivided into three valleys (Val Vibrata, Val Tordino and Val Vomano). Soils are mainly marly-clay and often red-tinged, while the climate is generally warm. Montepulcianos from the Colline Teramane can be quite powerful (especially the Riservas)—and are, in fact, at times too inky and brutally tannic. Though much hyped, this is a young production area whose true winemaking potential has yet to be fully understood. Well-known Abruzzo estates located in the area include Barba, Emidio Pepe, Nicodemi and Strappelli, but many others own vines here, including Illuminati (for example, their usually excellent Montepulciano d’Abruzzo Zanna is a “Colline Teramane”). The Chietino is a vast area subdivided into the Vastese to the south (mainly flatland, although the viticultural area extending westward from Ortona, a seaside town like Vasto, is hillier) and the more mountainous area surrounding towns like Guardiagrele and San Martino sulla Marrucina. The latter has a generally cooler microclimate and greater limestone soil content. The best-known estate is Masciarelli, with the Masciarelli-owned Castello di Semivicoli also nearby. The Pescarese is divided into two sub-areas; Vestina (or Terre dei Vestini) and Casauria (or Terre di Casauria). The former is situated to the north: Loreto Aprutino, Spoltore and Rosciano are important wine towns, and top producers include La Valentina, Valentini and Torre dei Beati. The landscape here features low-lying hills, with vineyard exposures looking out to the sea. However, microclimates differ greatly within this area: the Spoltore zone is closer to the sea and warmer (it’s the home of the La Valentina estate), with Rosciano and especially Loreto Aprutino’s climate influenced by a slightly hillier topography (reference point wineries here are Valentini and Torre dei Beati). Casauria, located to the south of the Vestina area and west of Pescara, is more mountainous, extending westwards into the Apennine mountains (Alanno, Bolognano, Cugnoli, Popoli and San Valentino are important wine towns in the area). Casauria’s vineyards look both eastwards towards the sea and westwards, the latter sites located in a far cooler microclimate. Wider day-night temperature variations are the norm in Casauria and so its white wines are fresh, minerally and potentially ageworthy, while its Montepulciano wines are some of Abruzzo’s most refined. Many of Abruzzo’s very best—as well as up-and-coming—wineries, such as Filomusi Guelfi, Tiberio and Valle Reale, are based here. L’Aquila, Abruzzo’s most important town, sits in a very mountainous area (right in the middle of the Gran Sasso), on soils that have a higher gravel content than those of Vestina, for example. Quality viticulture is possible in the more temperate reaches (for example, around the towns of Capestrano, Ofena and Sulmona, the latter world-famous for the production of confetti candy). Despite the mountainous landscape, it’s hot here in summertime: Ofena is nicknamed the “forno d’Abruzzo” (the Abruzzo oven). The high-quality Cataldi Madonna and the emerging Gentile Vini estates are situated near Ofena. Last but not least, the Val Peligna (the birthplace of the Montepulciano grape) is a specific sub-zone of L’Aquilano. Montepulciano wines made here appear to have outstanding potential and refinement. The best estate in this area—in fact one of Abruzzo’s finest—is Praesidium. On a completely different subject, readers may recall that Abruzzo made headlines a few years back following the vicious earthquake that devastated L’Aquila and the Aquilano area on April 6, 2009. The earthquake reached an intensity of 5.9 on the Richter scale and caused an estimated 309 deaths and more than 1,500 injuries—and 10 billion euros’ worth of damage to city infrastructures and to the countryside. The area has not yet fully recovered and the local economy is still struggling. The earthquake is not the only natural disaster Abruzzo has been subjected to in recent times. 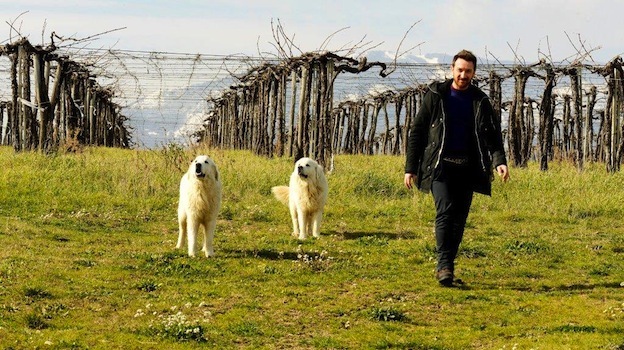 In 2013, a massive and very atypical November snowstorm hit the Chietino and Pescarese hardest, burying the old tendone vineyards under several feet of snow, with vines often snapping in two. I can’t even begin to describe the sick feeling I had in my gut as I surveyed row after row, hectare after hectare, of Trebbiano Abruzzese and Montepulciano vines on the ground; it was the equivalent of an agricultural war zone. (Valentini was one producer who was especially hard-hit.) And just this winter, a huge electrical power outage left a good part of Abruzzo without electricity for almost a week before things were back to normal. As many producers were planning to bottle at the time, it was yet another hardship the region didn’t need. In the final analysis, Abruzzo’s best wines can be revelations, but the fact that its wines have always been seen as cheap and cheerful, or simply as everyday quaffers, has hurt the region. That many estates—and not just the large-production bottlers—have seemed content over the years to make decent but essentially uninteresting wines that have been nonetheless hyped and highly scored (by others) has been another problem. The Montepulciano grape always delivers something decent, but its wines can be so much more than just that; and Pecorino, provided you choose the right examples, can give one of Italy’s five or six best white wines. Happily, a new generation of well-traveled 30-something owners is now taking the helm at many family wineries, and the wind of change is breathing new life into wines that are no longer merely inexpensive and simple but potentially very deep and complex. In Camillo Montori, Emidio Pepe and Valentini, Abruzzo has long boasted three of Italy’s best wine estates, but Cataldi Madonna, Nicodemi, Tiberio, Torre dei Beati and Valle Reale are five more Italian wine superstars in the making. The only Abruzzo red wine of note is Montepulciano. The variety is known for hearty, inexpensive everyday reds crammed with bright fruit, and while the variety does not have the nobility of Nebbiolo or Sangiovese, it can offer more than it is commonly given credit for. Montepulciano presents two main problems. Like Sangiovese, it’s a very reductive variety; hence off odors in poorly made wines are common. And while the grapes ripen and accumulate sugar easily, the seed tannins rarely reach full phenolic maturity. For this to happen, a long, slow growing season (a rarity in recent times) is an absolute necessity. Otherwise, wines with an underlying green astringency are common. In the past, a strong dose of sweet new oak was thought to be the answer, but countless massive, charmless wines that required extended bottle age to shed their tannic cloaks never actually developed much nuance in the process. The good news is that a talented new generation of producers taking over their family estates is moving away from oak-aging their entry-level Montepulcianos (the best of which can now be outstanding and almost Pinot Noir-like) and using oak sparingly for their Riservas. Keep an eye out for Cerasuolo d’Abruzzo: darker in color than most Rosés, it is perhaps Italy’s very best Rosato. Abruzzo’s white wines have improved enormously, with myriad of outstanding Trebbiano d’Abruzzo and Pecorino wines available nowadays. Trebbiano d’Abruzzo is the lighter-bodied of the two, characterized by delicate aromas and flavors of orchard fruits, white flowers and chamomile. Poor examples are remarkably thin and neutral, and that’s why the grape and the wine had previously earned a reputation for being nothing special. But the grape clearly holds significant potential, given that Valentini’s Trebbiano d’Abruzzo is considered by many to be Italy’s greatest white wine, and that Emidio Pepe, Camillo Montori and Tiberio have made wines as good as Valentini’s. Lack of knowledge is to blame here. First, most people don’t even know that Trebbiano d’Abruzzo is the name of the wine, with the grape called Trebbiano Abruzzese. There is actually no such thing as a Trebbiano, for that name refers to a group of mostly unrelated grapes, the best-known member of which is Trebbiano Toscano. The latter is a poor wine grape (interesting only in Vin Santo production) while Trebbiano Abruzzese is a high-quality variety. Second, for decades Trebbiano Abruzzese was confused with other local varieties, and nurseries routinely supplied wineries with Bombino Bianco (most frequently), Mostosa, Passerina or Trebbiano Toscano instead. In fact, the official production guidelines of Trebbiano d’Abruzzo call for a minimum of 85% Trebbiano Abruzzese and/or Trebbiano Toscano, which is nothing short of a disaster for Trebbiano Abruzzese. Be aware that some producers still say that Bombino Bianco is the same as Trebbiano Abruzzese, but that’s just not true. In any case, it’s hard to make quality wines when different grapes are grown in the same soils and harvested at the same time. It should come as no surprise that Valentini has the real thing in his vineyards. Pecorino is currently Italy’s hottest white wine. An early-ripening variety that accumulates sugar easily, Pecorino wines are bigger and higher in alcohol than Trebbiano d’Abruzzo. All but forgotten until the 1980s, when the variety was rediscovered in the Marche, Pecorino wines can be very reminiscent of those made with Sauvignon Blanc, offering aromas and flavors of sage, green fig and winter melon. Due to the category’s surge in popularity, everyone is producing Pecorino wine these days but many of the wines barely remind me of the variety. Furthermore, Pecorino is a mountain variety that likes higher slopes, but of course it’s now cultivated in flatlands too. So it’s best to stick with the wines recommended in this article. Passerina is another little-known grape that has been increasingly giving delicious Abruzzo wines. Unfortunately, much like with Trebbiano Abruzzese, Passerina has long been confused with other similar-looking but different varieties. For example there are “Passerina” grapes also grown in Marche and Lazio. However, these are not likely to be the same grape as the one grown in Abruzzo (for example, one “Passerina” variety in Lazio is actually an aromatic grape much like Moscato Bianco, and so it has nothing in common with the Abruzzo variety, which is non-aromatic). Abruzzo’s Passerina wines are characterized by a delicate lemony florality and sneaky concentration; I would say their aromas are closer to those of Trebbiano Abruzzese, while their flavors and weight are more similar to those of fuller-bodied Pecorino wines. The Romans cultivated grape vines in Molise in antiquity. In the 18th and 19th century, Molise’s were the most extensive vineyards in all of the Kingdom of Naples. However, over time the region’s extremely mountainous terrain discouraged the production of quality wine; today there are roughly 7,700 hectares under vine, including a mix of native and international grape varieties. The former are more typically grown in the northern part of the region, where winemaking has a longer history, while mostly international varieties are planted in the region’s south. The most common red varieties are Montepulciano and Sangiovese, but Aglianico, Barbera, Merlot, and Cabernet Sauvignon grow too. White grapes include Trebbiano Abruzzese (and Bombino Bianco, with which it was long confused), Trebbiano Toscano, Malvasia Bianca Lunga, Malvasia Bianca di Candia, Falanghina, Greco, Chardonnay, and Pinot Bianco. Only 10% of the region’s total wine production is of DOC wines (for what it’s worth, there are as yet no DOCGs in Molise). Molise’s three DOC wines are Biferno, Molise and Pentro di Isernia, and one of the better known IGT wines is Terre degli Osci, but these DOC wines have as yet no recognizable distinguishing features. Of the three, Biferno is the most famous. The best way to understand a region’s wines is by knowing the grapes grown there, and it’s no different with Molise. The rediscovery of two potentially high-quality native grapes, the red Tintilia and the white Cococciola, has helped Molise greatly. Regardless of what you may read elsewhere, Tintilia is not identical to Sardinia’s Bovale Grande. Today it’s the source of some exciting wines, but as usual in Italy, when a grape and wine become increasingly popular, strange things begin to happen. Much like Abruzzo’s Pecorino, Tintilia is a mountain variety, and while it was once grown only at about 400 meters above sea level, DOC Tintilia wines can be made with grapes grown at much lower altitudes, even in seaside locations. There are fewer than 75 hectares of Tintilia, of which half are old enough to be used to make wine. In contrast to Tintilia, Cococciola has not yet been studied and grown long enough for anyone to know its exact winemaking potential, but monovarietal wines I have tried, characterized by bright lemon, quince and chamomile notes, are promising. The 2011 vintage was one of the hottest in memory, with all phases of the growth cycle occurring earlier than usual. The harvest was the earliest in a decade and the wines often show a warm-weather personality (some pruney aromas and flavors in many reds, for example). The 2012 vintage was significantly better, especially for the white wines, the best of which are layered and complex. It too was a warm vintage, but the grapes were harvested only slightly earlier than usual. Wines from the 2013 growing season show characteristics of a much cooler vintage, which in fact was marred by rainfall in September: those producers who didn’t wait out the bad weather and allow their grapes to dry on the vines made diluted wines—in fact, most 2013s, white and red, lack real intensity. The worst vintage of the last four is 2014, as fall weather was atrocious, with almost non-stop September rain. The whites (especially Pecorino, since it’s an early-ripening variety) and the Cerasuolos have turned out better than expected, while the jury is out on the reds. Unfortunately, most of the 2014 wines I’ve tasted thus far present obvious traces of dilution in conjunction with unripe tannins. Remember that the best recent vintage for both Abruzzo and Molise is 2010; it was outstanding for both white and red wines.